For all the Asian cooking I've done in the past, I've oddly never made sticky rice before. So this represented not only something new to grill, but learning a whole different way to cook rice, which started with a couple cups of glutinous (sweet) rice. I first rinsed the rice off in a fine mesh strainer, then transferred it to a large bowl and covered with cold water. I let that sit out overnight, then in the morning, strained the rice, and steamed it in my steaming pot with the insert lined with cheesecloth. After 15 minutes of steaming, I flipped the now-solidly sticky rice disk over and continued to steam until the rice was cooked through and hadn't turned mushy at all. 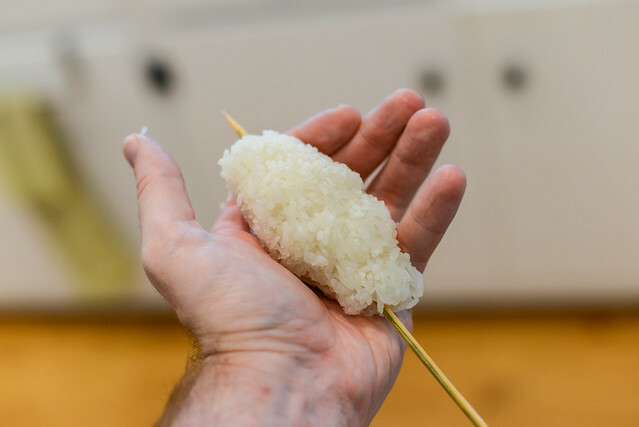 After letting the rice cool a bit, it was easy to break off chunks by the handful and roll them into a cylinder, which was the right shape to let a skewer securely hold the rice. Then I took the rice to grill, where I wasn't sure how it would handle. Luckily it didn't stick at all and developed nice browning pretty quickly over direct heat. My original idea with this recipe was to just get a rice skewer with a nice crispy exterior, but in doing some research, I found this idea was already claimed in Thailand, and they bested my plan with the addition of egg. 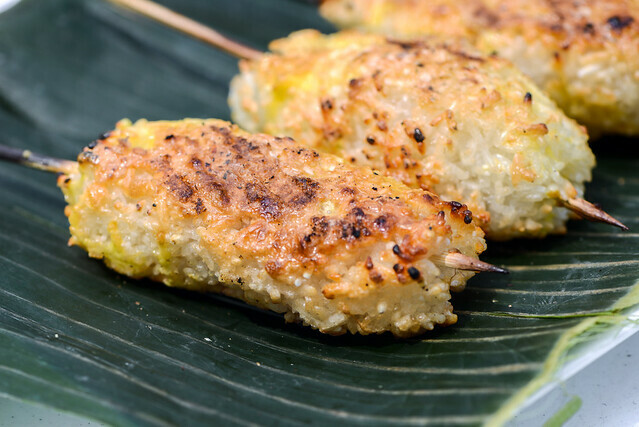 Not wanting an inferior product, I brushed my rice with whisked egg, which gave the skewers an appetizing yellow-orange hue paired with browning that clearly showed the crispy outside I was after. 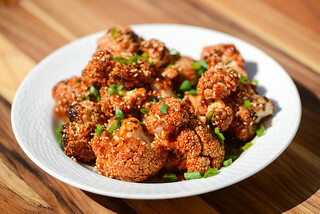 I love crispy rice, I love rice with egg, and I love grilling, so this combined to be an incredible side in my eyes. The exterior had a great crunch that, paired with the egg, added so much texture and flavor to the rice. The inside retained it's sticky rice characteristics, but was slightly drier than what I'm used to getting at a restaurant. 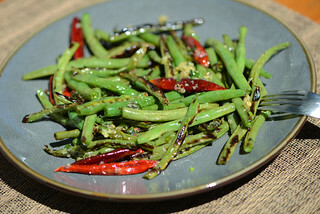 This made a drizzle of soy sauce a nice addition both in flavor and moisture, although it wasn't a necessity. 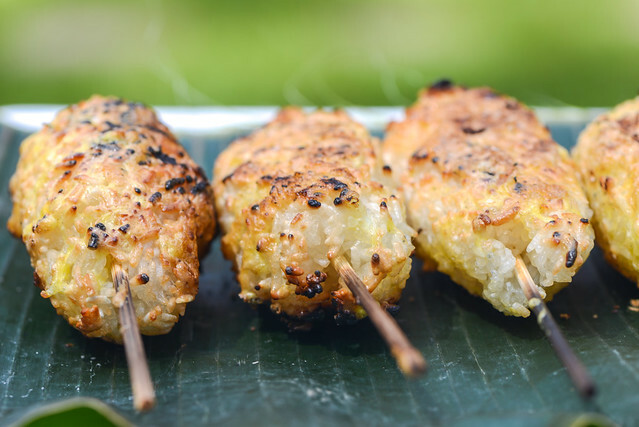 Of course, now that I've grilled rice, it will no longer have that initial excitement of doing something new, but my mind is going full steam on other ways I can grill up rice, and that will create some variations that I can look forward to trying out. 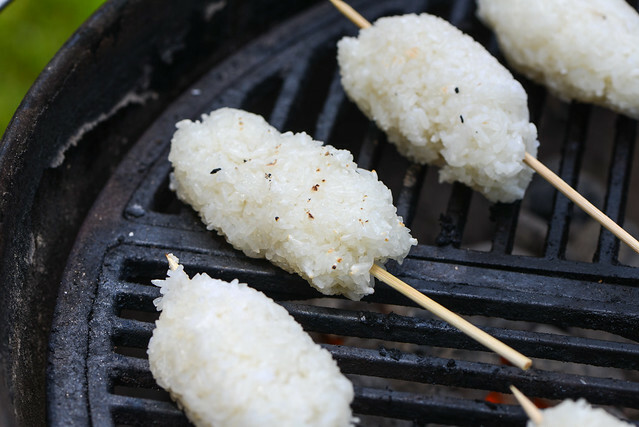 Sticky rice is skewered and grilled with a brushing of egg to created a rice side that has a great crispy exterior with a pleasing, simple flavor. 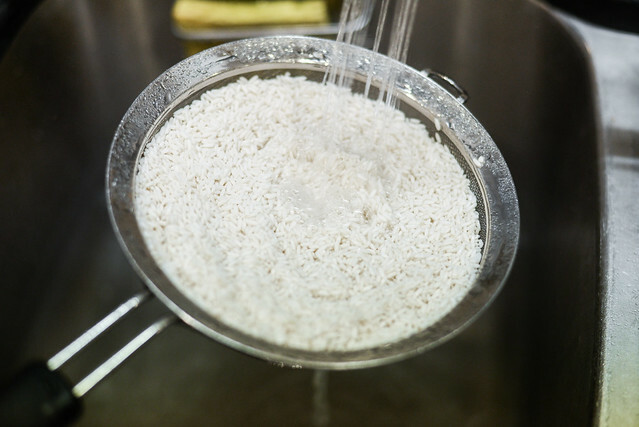 Place rice in a fine mesh strainer and rinse under running water for 1 minute. 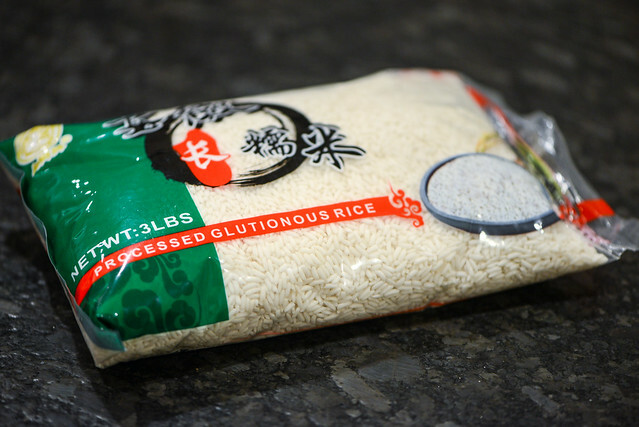 Transfer rice to a large bowl, cover completely with cold water, and let soak for 2 hours to overnight. Drain rice into a fine mesh strainer. 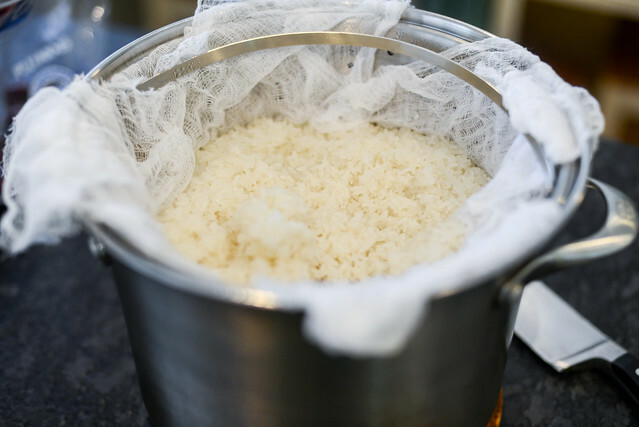 Transfer rice to steamer insert lined with cheesecloth. Place steamer insert in pot over 2 inches of rapidly simmering water and steam, covered, for 15 minutes. Flip rice over and continue to steam until rice is cooked through, 10-15 minute more. Remove pot from heat. Break off a handful of rice and roll into a cylinder. Run skewer lengthwise through rice. Repeat until all rice is skewered. Light one chimney full of charcoal. When all the charcoal is lit and covered with gray ash, pour out and spread the coals evenly over entire surface of coal grate. 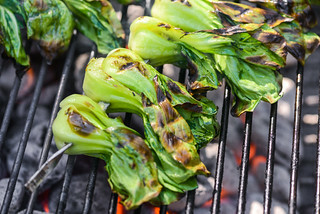 Set cooking grate in place, cover grill and allow to preheat for 5 minutes. Clean and oil the grilling grate. 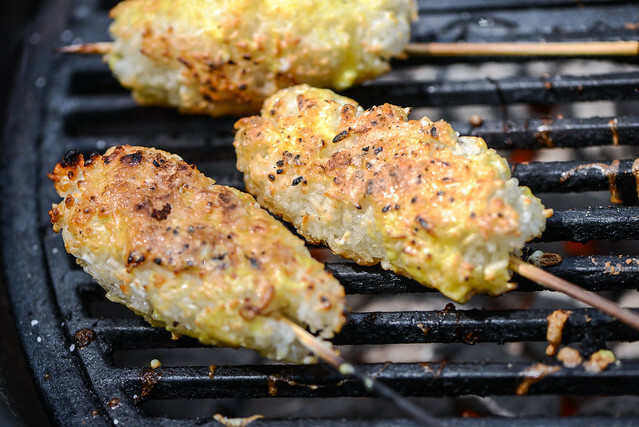 Place rice skewers on grill and cook until lightly browned all over. 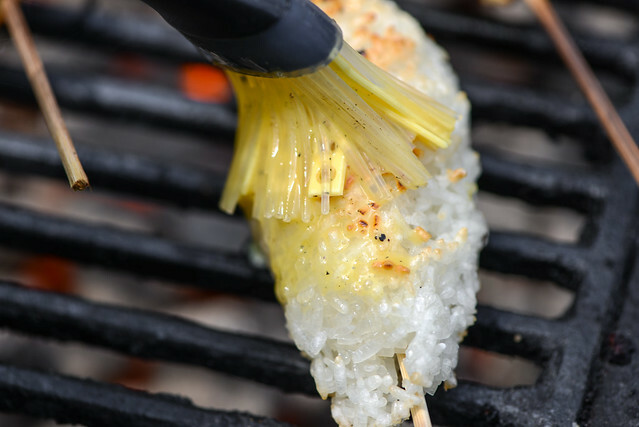 Brush rice with egg all over and continue to grill until egg is cooked and rice has additional browning. Transfer rice skewers to a serving plate and season with salt to taste. Serve immediately. @Dax Actually had both those sauces one hand, plus this one, which was my fav with the rice.